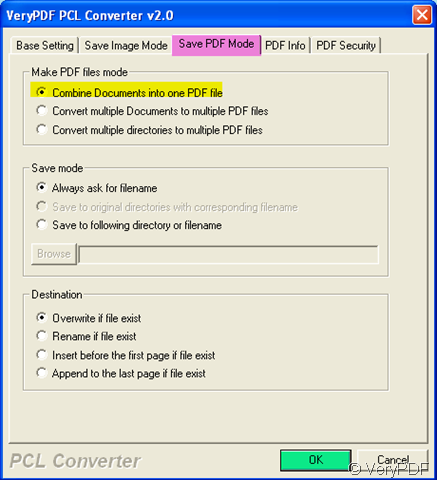 ← How to set both the page width and height while converting rtf to pdf? Some guy asked me that” I want to know is there any way to integrate your application which i can easily use to convert pcl into pdf.” I recommend him a software-VeryPDF PCL Converter v2.0 and he feel it is good to tackle his problem. If you have the same problem, please read this article. PCL (Printer control language) is the standard print format for HP LaserJet-compatible printers. If you are now printing to a laser printer, PCL is your choice. This kind of files could be created from any Windows application by simply "printing to file" with a LaserJet-compatible printer and PCL driver set as the current Windows printer. It is simple for us to handle, requires no licensed software and is inherently a true representation of the document. It is a simpler, faster and less expensive alternative to PostScript-based laser printers. There's no such thing as a free lunch, of course, PCL has fewer features than PostScript or it descendant, PDF. However, the vast majority of business documents do not require the power of PostScript. PCL was created from the beginning as a simple, open language. HP's business is printers, not proprietary page description languages. The result is that there are many vendors in the PCL business making printers, software which can better printing jobs, viewers, and more. This competition assures quality and cost effectiveness. So if we can convert the PCL to PDF, the situation will be totally different. Cause the PDF file is famous for its easy printing. 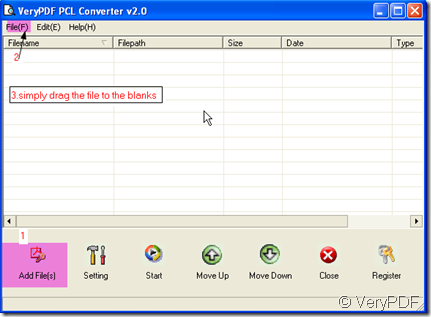 Then I will show you how to convert the PCL files to one PDF file by VeryPDF PCL Converter v2.0. Please be familiar with this software interface and add your files to it. I have marked three ways to add files; you can use any one it as you wish. As you want to convert pcl files into one pdf, please click “Setting” on the menu table then go to save mode label, you will find this option. Then please choose it and after conversion, all you PCL files will be converted to one PDF file. If you have finish the menu setting, please click “OK” to end the setting. Then click “Make PDF” to finish the conversion. It takes a few seconds to finish the conversion then you will see a PDF file show up on the desktop or some folder. How to convert all the pcl files in many directories to one pdf file simultaneously? How to Convert Pcl to Pxl? How to convert PXL to PDF and rotate the page? Convert pcl to jpg and rotate page via command line? This entry was posted in VeryPDF Blog and tagged PCL Converter, PCL to PDF. Bookmark the permalink.